Wimbledon II is finally coming together! This is an extension and refurbishment project of a terraced house. Agreeing with the neighbours what could and should be done (and when) took some time. Works is now hopefully going to start in January. Apart from working out technical details, we invested time in designing a kitchen that would fit in with the understated, light, relaxed and homey feel of the living space. The kitchen will be at its centre: lounge to one side, dining and relaxing to the other. It couldn't be totally modern and a Victorian retro look would look strange as well. Client's wishes: lots of storage, butler sink, light colours, double oven and nothing that would look too fancy (my words). Lots of discussions later and we have worked out something that I think, will be quietly spectacular: a mix of contemporary and the traditional. Modern work surface and big, handleless drawers and cupboards to one end, a traditional shaker-style island with wooden knobs and butler sink next to it. The photo above gives an impression. It is a zoom of the kitchen moodboard+ (here to the left) I used to explain my ideas. It will look out onto an exposed beam ceiling on one end and a Victorian fireplace on the other. The tiles will be old-fashioned and glazed with imperfections, to tone down the modern cupboards. The appliances will be a mix as well: a SMEG 50s fridge and a stainless steel cooker with double oven. With the client's old dresser and plate-rack (similar to the one in the photo), the kitchen will look as if it has always been there, grown overtime, with modern bits and older parts. The final lay-out changed considerably from what we started off with: the kitchen shifted to the centre of the space, with dining to the back (not on this detailed drawing). The floor will be in ash or oak planks, but the kitchen will have a stone floor, laid as if it were a rug, with wood around it. This will be achieved by continuing the wood a little bit into the kitchen and by placing the island slightly off the tiled area. Lines of where the tiled area is going to be are just about visible in the drawing. Storage space was a big issue... This is one of the drawings showing a bespoke housing for the boiler. It will be placed high up, so that below it there will be a 1.8 meter tall storage space. 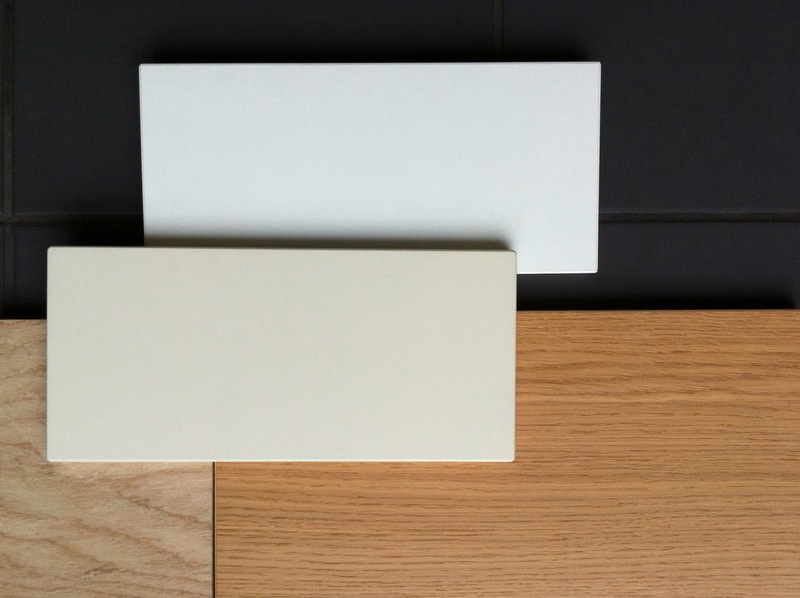 Samples of the different finishes in the kitchen: cream and a light grey for island and cupboards, ash for the floor (to the left) and oak for the top cupboards. Very understated and soothing! This was the original proposal for the new lay-out. The kitchen has now moved to the left and the dining area more to the right.